The Russia Investigations: Interference Impacted Real Life; Senators Propose New Law Stories pile up about real-life activity linked to Russian influence-mongers, senators pitch new law on digital political ads and committee hearing postponed for Trump's longtime personal lawyer. 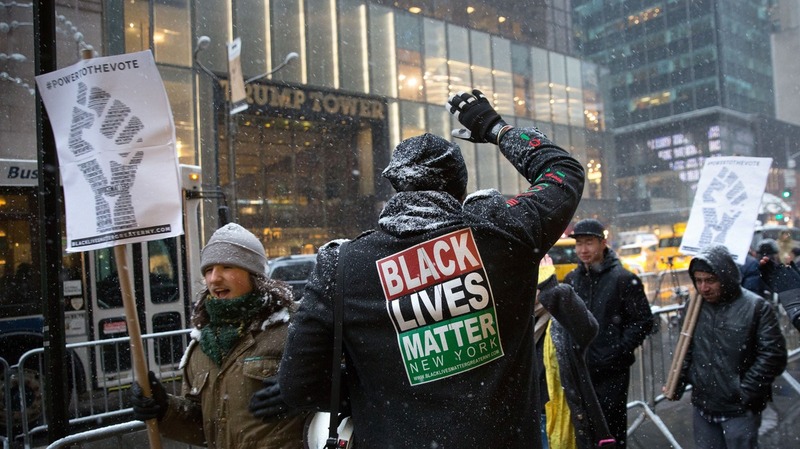 Black Lives Matter activists march in front of Trump Tower on January 14, 2017, in New York City. Last week in the Russia investigations: Reports are growing about Russian-linked interference beyond the Web and in real life, three senators pitch a bill to tackle digital active measures and Big Tech says it'll play ball in Capitol Hill's big show on Nov. 1. Accounts are piling up in which Russian influence-mongers evidently did more than interfere with Americans online last year — they also did so in person. In New York and elsewhere, agents paid personal trainers to lead self-defense classes aimed at black activists with the message that they might need to "protect your rights," as part of the Black Lives Matter movement. In Florida, they used Facebook and fraudulent websites to organize black rights protest rallies. In Texas, scamsters organized at least one armed, anti-Muslim protest in Houston. And in Idaho, they helped organize anti-immigrant rallies. Each passing week brings more such accounts as members of Congress, Justice Department investigators and tech companies look back at things they didn't know to view as suspicious at the time. And each new story only adds to the frustration of Americans learning they were deceived. "For any group to collude to take advantage of the pain and anguish that African Americans — or any group — are experiencing in this country in order to sow further discord is disappointing and revolting," activist Raven Solomon told BuzzFeed. Members of the Congressional Black Caucus are frustrated too. Three senators are sticking their toe in the water: Senate Armed Services Committee Chairman John McCain, R-Ariz., and Democrats Amy Klobuchar of Minnesota and Mark Warner of Virginia have offered a bill. It would mandate that big social networks disclose the national origins of the buyers of political ads, and make their contents available to view at any time. "First and foremost this is an issue of national security — Russia attacked us and will continue to use different tactics to undermine our democracy and divide our country, including by purchasing disruptive online political ads," as Klobuchar said on Thursday. Big Tech isn't crazy about these potential regulations, however, and is expected to fight them inside Washington, D.C. Plus, the sponsors of the legislation concede on their own that the bill — even if it passed and was signed by President Trump — would only use a "light touch" with the big tech companies, and wouldn't do anything on its own to stop Russia's ongoing campaign of active measures. Even so, Warner, who is the vice chairman of the Senate Intelligence Committee, told NPR's Mary Louise Kelly that the least Congress could do is close the gap in requirements for foreign spending on old-style political ads and digital ones. "In an era where $1.4 billion was spent on political advertising in the 2016 campaigns — and that number's only going to go up — there needs to be equality between traditional radio and broadcast and social media and Internet political advertising," he said. For many lawmakers, the work is already done: Congress has already toughened sanctions against Russia in retaliation for its attack on the election and taken away President Trump's ability to lift them without its approval. As to whether Capitol Hill does anything else to try to dissuade Russians or strengthen American elections, both chambers are waiting on the release of the Intelligence Committee's full report about what happened. When's that going to be? "Whether that's done by the end of this year, or beginning next quarter it's going to be tough to see it done by the end of this year," Warner told Kelly. "We want to get this done as quickly as possible, but we've got to get to the facts." Expect to hear a great deal more about the way Russian influence-mongers used social media platforms at the much-discussed Nov. 1 hearings convened by the House and Senate Intelligence Committees. Last week included a couple more developments on that score. First, Google confirmed that it will send a representative to take part — the search and advertising behemoth had previously been reticent as to whether it would have anybody there. Second, Google and the other two big players here — Twitter and Facebook — announced who specifically they'll place in the hot seat: their top lawyers. Facebook General Counsel Colin Stretch, acting Twitter General Counsel Sean Edgett and Google General Counsel Kent Walker, the companies said. That news was reported by Tony Romm of Recode. Warner and other members of Congress mention these hearings every time they talk to anyone about the Russia imbroglio these days, but there's no telling how it will go. Democrats may want a fireworks display. The Big Tech witnesses likely want to make as little news as they possibly can. The Senate Intelligence Committee postponed a hearing scheduled for Oct. 25 with Donald Trump's longtime attorney Michael Cohen. He was supposed to have appeared in public after the committee spiked a closed-door session last month — Cohen had issued a statement before his meeting even though he'd agreed not to discuss it. 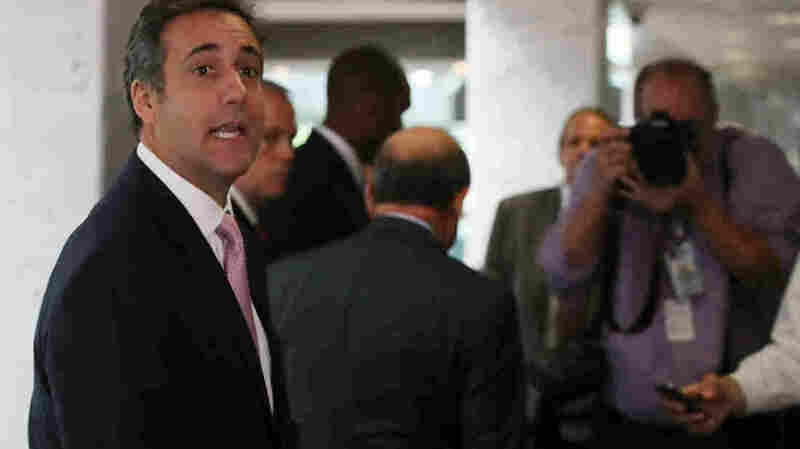 Michael Cohen, President Donald Trump's longtime personal lawyer, speaks to the media after finding out a closed-door meeting with Senate Intelligence Committee at which he was to appear was canceled, on September 19, 2017, in Washington, D.C. Meaning what? There's nothing nefarious about the Cohen hearing postponement, from what NPR understands. It appears to have simply been a calendar issue. Intelligence Committee Chairman Sen. Richard Burr, R-N.C., said only that it would be "rescheduled at a later date." CIA Director Mike Pompeo told an audience in D.C. on Thursday that the U.S. intelligence community's assessment about Russia's attack on the election concluded that it did not alter the outcome, as Greg Miller reported in The Washington Post. Only that's not what the "I.C.," as spy types call it, said. The assessment — a version of which you can read here — did not get into this question. American intelligence officers "do not analyze U.S. political processes or U.S. public opinion." Meaning what? Critics within the spy world told The Post this is yet more evidence that Pompeo is too political to be an honest spy boss — too close to President Trump. A CIA spokesman told The Post that Pompeo was nothing of the kind, and hadn't meant to rewrite history or the IC report. Former White House press secretary Sean Spicer talked with investigators working for Justice Department special counsel Robert Mueller on Monday, as Politico's Annie Karnie and Josh Dawsey reported. Mueller's investigators also have interviewed interim national security adviser Keith Kellogg, who followed retired Lt. Gen. Mike Flynn after his ouster, the correspondents write. Karnie and Dawsey report that Mueller next wants to meet with White House communications director Hope Hicks and White House Counsel Don McGahn, but those sessions haven't yet been scheduled. Meaning what? Spicer has been described as a voluminous note-taker, always writing-writing-writing things down during the many meetings in which he participated. Mueller's team likely wants not only to get Spicer's verbal account of events that took place inside the White House but his contemporaneous notes. Axios reporter Mike Allen had a kerfuffle over this: Allen pinged Spicer to ask about the role his notes might play in the imbroglio, and Spicer told him to jump in a lake. Timeline Of Trump And Russia In Mid-2016: A Series Of Coincidences Or Something More?